Gyro-stabilised and standard PTZ cameras flown at high altitudes on small Skyhook Helikites provide persistent surveillance for security applications. This system is also useful for use on military test ranges, for film work, and research. 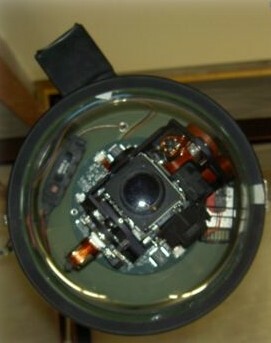 Gyro-Stabilisation of the video camera allows objects to be seen clearly at great distances. Useful surveillance can be achieved at such a distance that the small Helikite used is invisible to those being observed and out of range of small arms fire. This allows silent, undetectable, persistent surveillance with insignificant running costs. 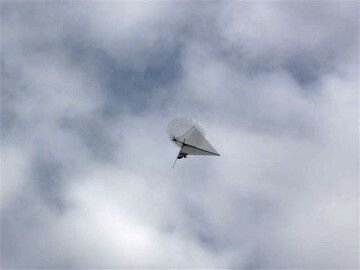 Gyro-Stabilized Video Camera flying on an 11 cubic metre Skyhook Helikite. Damped Pendulum Mount on Helikite keel gives stable 360 degree uninterrupted view. This US made camera was designed for use on small unmanned aerial vehicles, and in constant use in Afganistan and Iraq for the US Army within UAV's. This small gyro-stabilized video camera is one of the most sophisticated units in the world. It can fly up to 2,500 feet high fitted onto the keel of Helikites sized 10 cubic metres or larger. 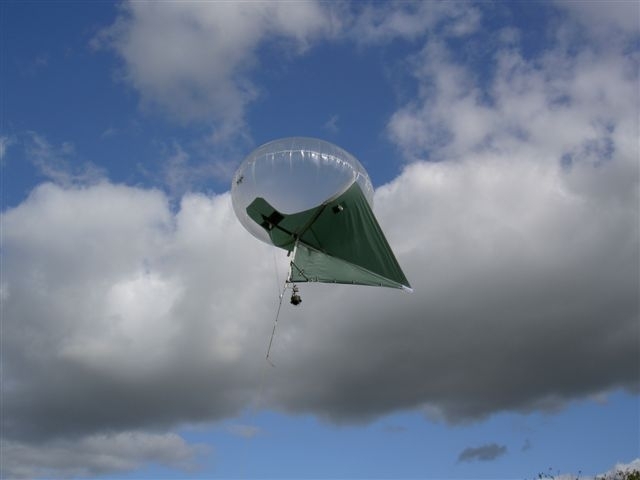 It can also be attached anywhere along the flying line with an "Allsopp Fin/Picavet" - which allows batteries to be changed without bringing the Helikite close to the ground. The camera's performance from the Helikite platform is outstanding, allowing steady viewing of people or vehicles from miles away. At such distances that the Helikite is likely to be invisible to the naked eye of those being observed and be beyond the range of small-arms fire. So this system allows discrete, persistent observation from considerable altitude with little risk to the Helikite or its operators. 14 hours in standby or 4 hours continuous use from 1Kg of standard mercury C-cell batteries. 28 hours in standby or 8 hours continuous use from 1Kg of lithium batteries. 2.4GHz Video Receiver with high gain antenna. Video Display ground station operates from 12 Volts or AC supply. This U.K. made camera has advantages in terms of robustness, foul-weather use and ease of camera exchange. It was very sucsessfully used by the British Army for the 2005 URBEX Urban Warfare Excercise on Salisbury Plain. 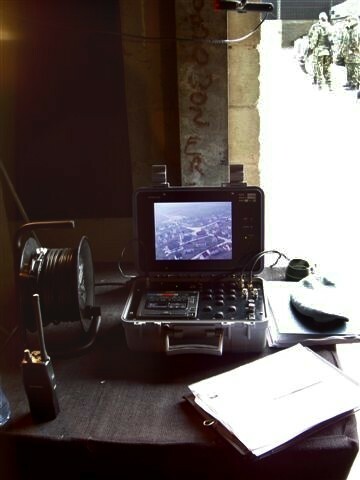 During two weeks of winter rain, wind and snow the Helikite Camera was 100% reliable as the urban aerial overview camera. Its instant deployment and direct controllability from the Operations HQ was greatly valued by the URBEX commanders. It was noted that simply the knowledge that the camera was airborne was enough to significantly alter individual troops military actions and also their personal behaviour. The Helikite Camera is a very practical piece of equipment. Perfect for surveillance within 800 metres. 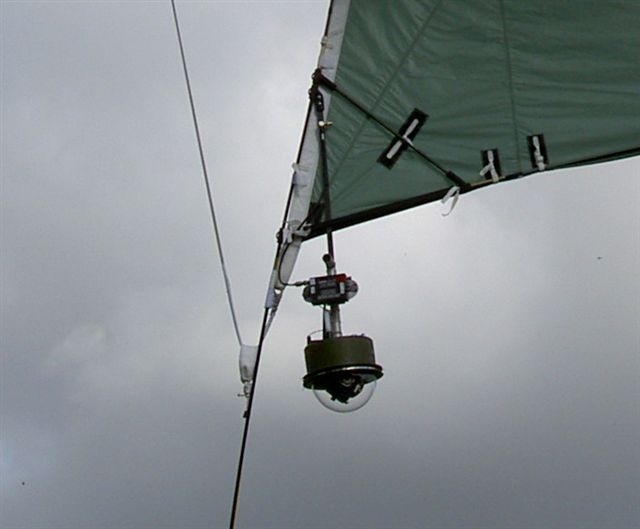 An aerial cameras designed for British conditions cannot afford to be just a fair-weather friend. 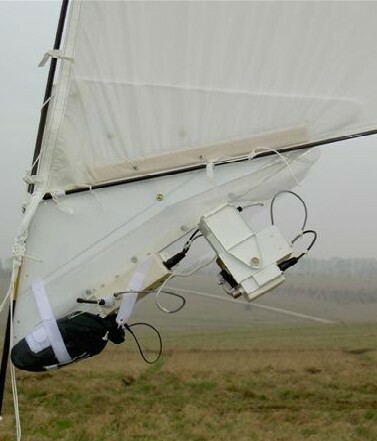 It is water-resistant, and probably the only aerostat borne, radio-downlinked video camera with a windscreen wiper - essential in wet weather. Also, the unique modular camera/radio transceiver/battery pack configuration allows the attachment of an optional thermal camera, eases maintenance and speeds up battery changes. Water-resistant - allowing it to exploit the Helikites all-weather capabilities. Weighs 2 Kg - including 8 Hours of batteries. Seperate Battery pack for ease of use and safety. Easily attachable to All-Weather Skyhook Helikites of 11 cu metres or larger. Water and Shock Proof Case.